Kid Elberfeld's Chattanooga Team Pounds Perritt and Benton Hard. Special to The New York Times. CHATTANOOGA, Tenn., April 5. 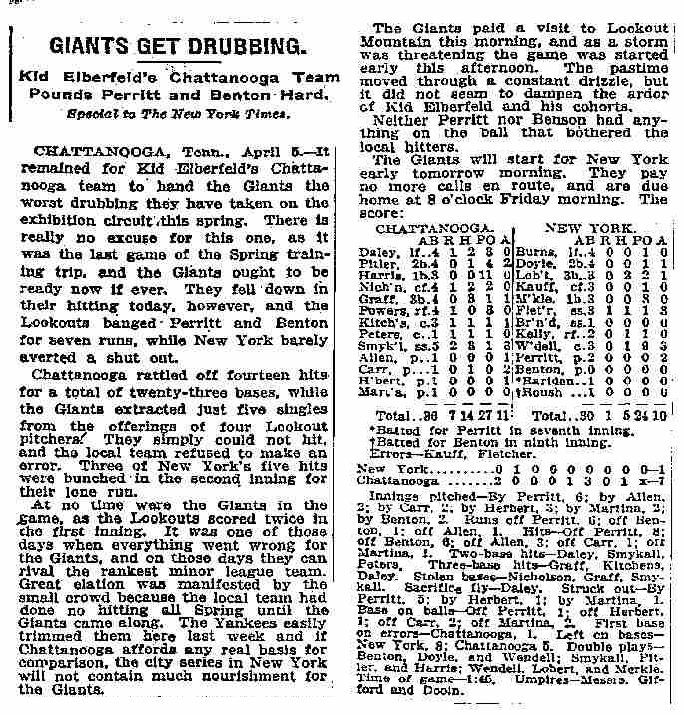 - It remained for Kid Elberfeld's Chattanooga team to hand the Giants the worst drubbing they have taken on the exhibition circuit this spring. There is really no excuse for this one, as it was the last game of the Spring training trip. and the Giants ought to be ready now if ever. They fell down in their hitting today, however, and the Lookouts banged Perritt and Benton for seven runs, while New York barely averted a shut out. Chattanooga rattled off fourteen hits for a total of twenty-three bases, while the Giants extracted just five singles from the offerings of four Lookout pitchers. They simply could not hit, and the local team refused to make an error. Three of New York's five hits were bunched in the second inning for their lone run. At no time were the Giants in the game, as the Lookouts scored twice in the first inning. It was one of those days when everything went wrong for the Giants, and on those days they can rival the rankest minor league team. Great elation was manifested by the smali crowd because the local team had done no hitting all Spring until the Giants came along. The Yankees easily trimmed them here last week and if Chattanooga affords any real basis for comparison, the city series in New York will not contain much nourishment for the Giants. The Giants paid a visit to Lookout Mountain this morning, and as a storm was threatening the game was started early this afternoon. The pastime moved through a constant drizzle, but it did not seem to dampen the ardor of Kid Elberfeld and his cohorts. Neither Perritt nor Benson had anything on the ball that bothered the local hitters. The Giants will start for New York early tomorrow morning. They pay no more calls en route, and are due home at 8 o'clock Friday morning.